Jim Robb describes the Cattle Market for the coming year at the Colorado Farm Show. The cattle market remains volatile as market analysts try to determine how much corn will be planted in 2012. With the United States becoming an ethanol-producing country, there is a lot of volatility in calf and yearling prices, according to Jim Robb, director of the Livestock Marketing Information Center in Denver, Colo. Robb presented an overview of beef cattle markets, and how they affect profitability during the Colorado Farm Show in Greeley, Colo.
Robb said that while corn was $6.20 to $6.30 a bushel in 2011, 2012 prices will be dependent upon how many acres are actually planted. Robb looks for a planting intentions report that will be released by USDA next month to indicate that somewhere between 92.8 to 94.8 million acres of corn will be planted in 2012. In 2011, 91,921,000 acres were planted, according to the USDA National Agricultural Statistics Service. 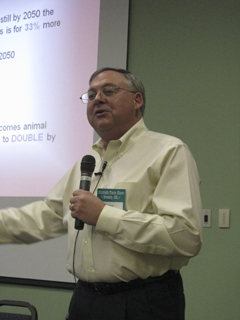 Robb told cow-calf producers he anticipates good calf and yearling markets for 2012. “I didn’t anticipate a month ago seeing $1.71 southern plains five and six weight calves this month. Especially since they just went through a drought,” he said. Robb predicts calf prices to be at $1.60 and above this fall, and even higher in 2013. He also told producers not to expect 55 cent cull cows again anytime soon. In 2013, he predicts cull cows to be over 90 cents a pound. 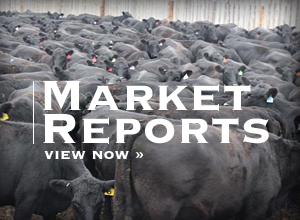 “We have continued to run up calf and yearling prices to the point where the U.S. economy might have to catch up or corn comes down before we see prices go much higher,” he said. Unfortunately, not all segments of the cattle industry are seeing a profit. Robb said cattle feeders and packing plants are losing money. 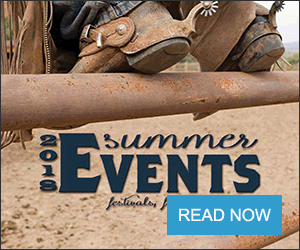 “The feedlots are losing piles of money right now,” he said. “We are going to see some feedlots going out of business in the coming year.” The same holds true for packing plants, who were losing $100 on every carcass they processed last week.